This is the first and perhaps only article I will write about something we have developed and are now offering as our comprehensive consulting service. So dear reader please indulge me. I normally write about topics that I think are important for the strategic management of for-profit firms and while I give my opinions, I try to write objectively. I cite other works I think are authoritative on each topic, but not this time. This is an all out marketing piece that I also hope will inform and excite you. But please stop reading if I offend you. If you do read further however and find this interesting, there are two Working Papers in this website for further detail. 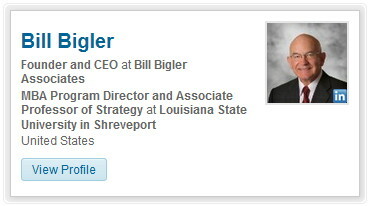 And by the way Bill Bigler Associates offers a variety of bread-and-butter, tried and true services. The Business Performance Engine is a near complete approach to strategic management of your firm and we realize most firms will not engage us for such a comprehensive offering. But each firm can take away something from it in our writings. Revolutionary is defined as: “radically new or innovative; outside or beyond established procedure, principles, etc.” I think what you will read here is not radically new but it is innovative and outside or beyond established procedure, principles, etc. But of course you will be the judge. 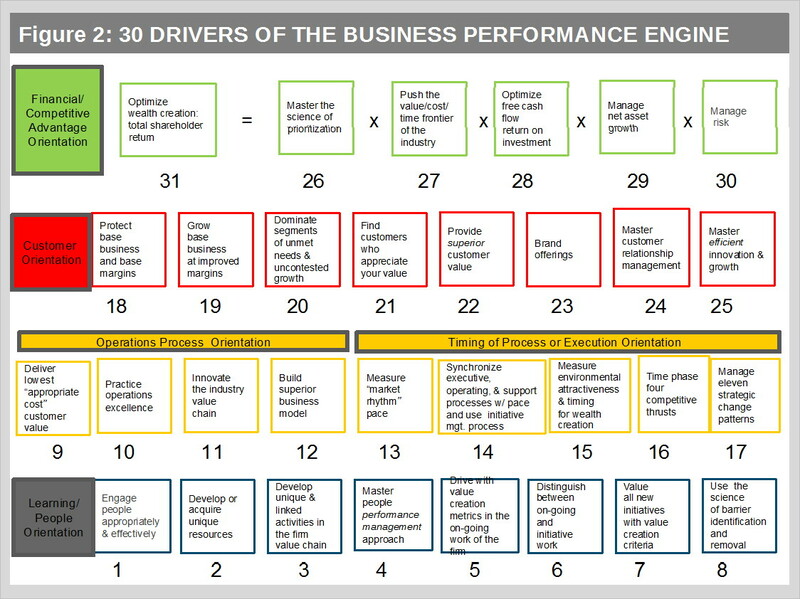 What is the Business Performance Engine (hereafter BPE)? In a nutshell, it is we think the first truly dynamic approach for the strategic management of the for-profit firm. The end goal is to help for-profit firms increase total shareholder return for the publicly traded firm or owner wealth for the private for-profit firm. Not from a purely financial sense, but from that sense plus a strategy formulation, innovation, operations excellence, customer, leadership and risk management sense, among others as you will see. The BPE aligns a changing external environment with the firm’s total strategic response to that change on a near continuous basis. No other strategy framework of which we are aware does this. The payoff? We project annual growth in the market value of your firm 20% greater than rivals who rely on traditional strategic management. I know this is a bold statement and the qualifier is this is true if no abnormal shock hits the firm. Think of what happened to Chipotle with the botulism issue in two of its restaurants. Its stock price fell from around $800 per share to $400 in a few weeks. The BPE would not have helped here. Why is this a big deal? We think it is huge deal, as your firm’s strategy as we will depict it needs to be continuously aligned with your firm’s changing ECC. If the ECC changes in eighteen months, so should your firm’s strategy. Wow. All successful firms make adjustments, but these alignments are typically “lumpy” and not continuous. But we need to have a framework to describe your firm’s strategy that allows it to continuously align with a changing ECC. All current strategy frameworks that we are aware of that describe your strategy will not allow this dynamic alignment. Enter the thirty Drivers of total shareholder return or owner wealth. After thirty years of experimentation and trial and error and with some academic research underpinning, Figure 2 depicts the thirty Drivers that have worked for us. Thirty Drivers may seem like a lot of stuff and you might ask why thirty and not five or seventy? After all, most supply chain projects can have over a thousand activities in a project flow diagram. These thirty Drivers are what we think are the “minimum, necessary and sufficient” things to grow the value of your firm. So the thirty number is not too few and not too many. We think these represent the 80-20 rule. The thirty Drivers are eighty percent of what you need to focus on to grow the value of your firm. Notice above we say the BPE is for the strategic management of your firm. It is not for day-to-day operations and ubiquitous daily fire fighting. So there is stuff that is not included directly in the thirty Drivers. This other “stuff” is pulled at the right time and in the right amount to make key decisions. But we think CEOs and executives will find surety and security in leading and managing just these thirty things. Of course over time these Drivers will change, but for now they seem to work to get the job done of growing the value of for-profit firms. So the BPE is fifteen Dimensions of ECC and thirty Drivers of total shareholder return in alignment with a trending ECC. Thus there are forty-five things to consider and take action on. You should measure your ECC every eighteen months and give an overall assessment of how your ECC is trending. Is High ECC going to Moderate or Moderate to Low or the other way, is your ECC becoming more favorable? Give emphasis to an appropriate sub-set of Drivers based on the trending ECC. 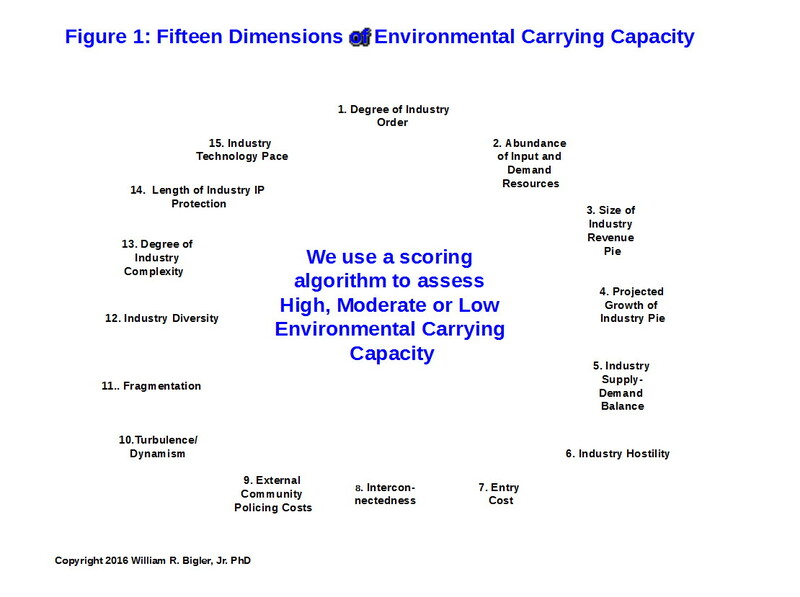 By the way the thirty Drivers are “pockets of decisions” not tools or frameworks. So the BPE can compliment to current tools and frameworks your firm already uses. Not all of the thirty Drivers need to be worked on at once, although this would be the ideal in varying degrees of emphasis. In Working Paper #7 we show how to decide which Drivers to focus on depending on the trending ECC. A small program office reporting to the CEO should aid the BPE. If your firm already has a strategic planning group, that group can take on these accountabilities. So we hope we have interested you to consider the importance of dynamically aligning your firm’s strategy to a changing external environment. Please see our two Working Papers if we have interested you.